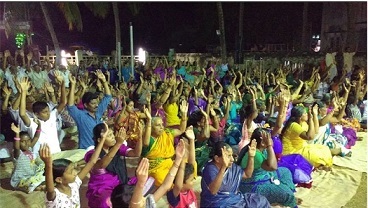 Kanyakumari, TN: ISKCON devotees here are in the process of holding fifty Gita Yajnas for ISKCON’s 50th anniversary. “In this program, our aim is to distribute 5,000 copies of Srila Prabhupada’s Bhagavad-gita As It Is, and to have recipients take an oath during a fire ceremony to read at least one page daily,” says organizer Vikrama Govinda Dasa. 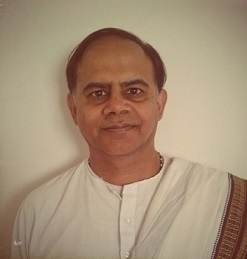 With his first novel, The Yoga Zapper, ISKCON devotee Hari Mohana Dasa (Mohan Ashtakala) has blended exciting fantasy storytelling with themes from the Srimad- Bhagavatam, including the prophesied appearance of Kalki Avatara at the end of Kali-yuga. He hopes to entertain and educate a diverse Western audience with this potent mix, published by mid-sized Canadian publisher Books We Love. Govardhan Eco-village, Mumbai: The sweet glance of youthful Sri Sri Radha-Vrndavana-Bihari, the idyllic frame of the Vrndavana forest replica – with the seven main temples and the flowing Yamuna – the professional and helpful mood of everyone in the Ecovillage, the natural amenities and the rural setting provided the ideal atmosphere for the training in an environment that is living testimony of inspired leadership. This was the beginning of the one-year course which includes two residential sessions (the next in September- October), a dozen or so online courses and the Action Learning Project, the practical assignment each student will have to complete putting into practice the learning in the classroom. New Delhi: GBC and ISKCON New Delhi leader Gopala Krishna Goswami had the opportunity to meet with Indian Prime Minister Narendra Modi at his residence in the capital city, to discuss ISKCON’s work. Mr. Modi is known for promoting the Bhagavad-gita, and so Gopala Krishna Maharaja gifted him a special deluxe edition of Srila Prabhupada’s Bhagavad-gita As It Is. Nairobi, Kenya: The new “Hare Krishna Training Centre” in Nairobi, Kenya, has become a popular accommodation destination for local African students, who are chanting, studying Çrila Prabhupada’s books, and following the four regulative principles of Krishna consciousness. 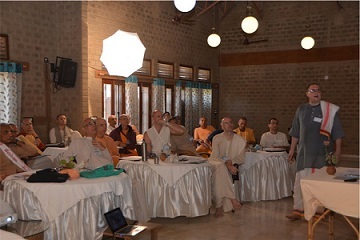 “We teach from Prabhupada’s books like The Science of Self Realization, Journey of Self-Discovery and Perfect Questions Perfect Answers, showing them that his words and Vedic culture can be relevant in the modern world and improve their everyday lives,” Govinda Prema Dasa says. Budapest, Hungary: Every February in Europe, people say goodbye to the cold and dark winter and welcome spring in a celebratory way, singing, dancing, and dressed up in colorful costumes. 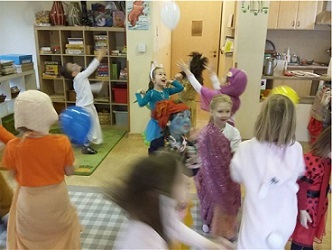 The students of Krishna-valley and the Budapest Gurukula’s nursery schools did not want to miss out on the fun all their fellow nursery schoolers enjoy during this season, so with the help of their teachers, they also put up their own show. The day of the carnival was full of activities – they decorated the school, enjoyed dancing and singing, playing with the balloons, eating delicious donuts, but everyone agreed, the highlight of the day was the Krishnaconscious costume party.